Well below you can read an on set interview, by Fandango. Then click here to see an exclusive featurette of Harry VS. Voldemort by XFinitytv. And third. ABC Family has a Harry Potter exclusive and below you can see the first footage! and then there's also Virgin Movies who has an article called "Daniel Radcliffe not a natural actor"
Then I remember I haven't posted the promo video for the How to Succeed in Business Without Really Trying soundtrack with Rose Hemingway talking to Daniel and John yet, so you see that also below. Q. What do you think about Snape and his actions? Daniel Radcliffe: I'm not in a position to judge. People do incredible things for love, particularly for unrequited love. I don't think it's the course of action everybody would take, but it eventually turns out to be a very noble one. I think Harry can understand Snape's. 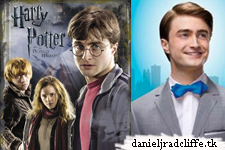 Q. Daniel, what is your favorite scene in Deathly Hallows? Radcliffe: That scene in the woods, and the actual walking through the forest, was always going to be my favorite. I felt like I had completely not done well enough. I know I certainly gave it everything. When you put that much pressure on yourself, the whole day becomes about, this is the most important scene; we have to get this right. Q. How did you prepare for the scene at King's Cross? Radcliffe: My preparation is mainly just knowing the lines and getting in and knowing where your character is, knowing what it's about and having ideas that you can put in on the day. There was nothing great. I don't know what even Daniel Day Lewis would do to prepare for a scene in the afterlife. Q. Was there a scene where you thought, Harry's a man now? Radcliffe: He's not at any point, really. He grows up hugely in this film, no more so than at the end when he makes a decision at King's Cross station: Go back rather than dying the death he's already suffered and going on to a peaceful afterlife. But he is still a boy and that's what makes it so affective and so awful when Voldemort is trying to kill him. Q. What did you think of the epilogue filming? Radcliffe: It was one of those things I was nervous about. The version I saw of me was great. I do look like my dad. They'll make it look good. Q. What happens with Harry and Ginny? Radcliffe: There's a couple of kissing scenes. There's even a kiss in the heat of battle at one point, which I have to say was my suggestion [laughs]. It's done in a less dramatic way, just like you're going out the door in a rush because it's potentially the last time they see each other. If I were in that situation, I would kiss almost anyone if I thought the end was coming.